This rather unusual plugin caught my eye this month. 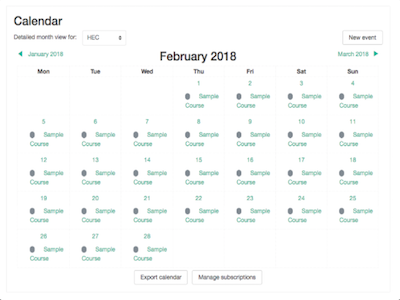 Essentially this plugin does exactly what its name suggests – it takes Courses and adds them directly to the Calendar and Site Events (so everyone sees them in sth Calendar). I can see this being useful in a number of use cases, but obviously it’s not for everyone! Users can access a Course through a link in the Calendar. Administrators can update the Course date directly from the Calendar. It supports drag and drops functionality so automatically updates the Course with the new dates – cool ! You can alter the text link that takes users to the Course. You can change the courses Categories that will display.